Christmas time is upon us. Let the craziness begin! As we wrapped up Thanksgiving I started feeling sad to say goodbye to fall which is my most favorite time of year. Its always an interesting transition since we go from giving thanks and feeling so grateful to the season of spending lots of money on excessive items that really nobody needs. Don’t get me wrong I love Christmas but the transition period normally takes me some time. This year I thought I would hit it head on and get some decorating done the day after Thanksgiving so that my nostalgia wouldn’t set it. I will also have more time to enjoy the beautiful decorations which is definitely my favorite part of the season. 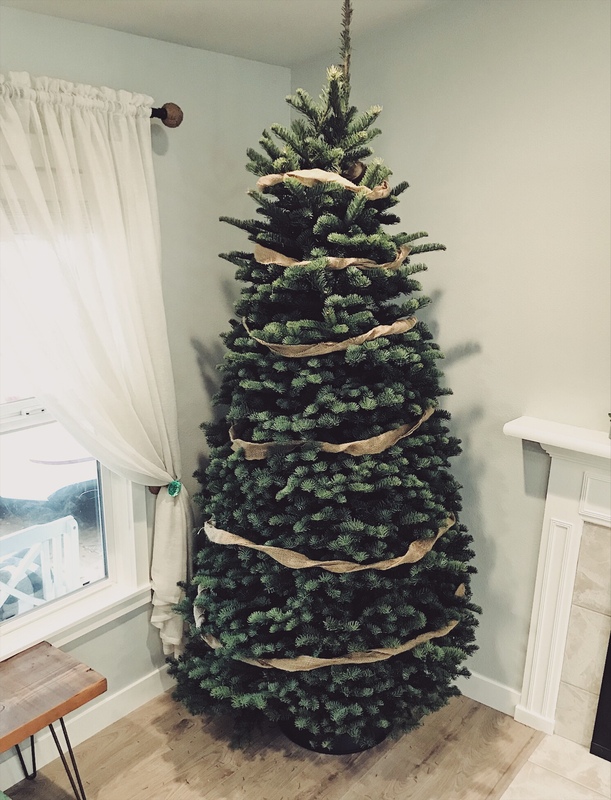 Step 1: Go get yourself a beautiful tree. I really wanted to go cut down our tree since that is what my family always did growing up but the cut-it-yourself places closest to us take hours to get to. 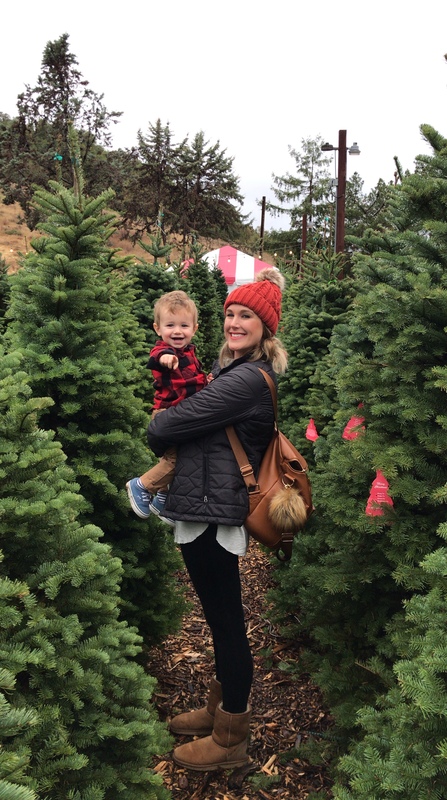 We settled for an adorable Christmas tree farm out in country that makes you feel those same festive vibes. They have hot popcorn, hot chocolate, and a few different photo set up areas for the kids. Beckett loved it and he had a blast picking it out. 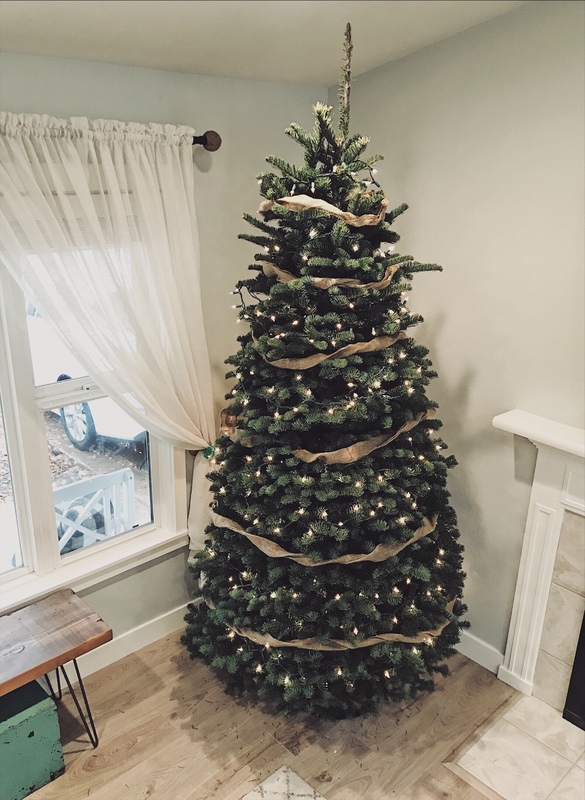 This is the first year in our new house so we were able to get a taller one this year since we have vaulted ceilings. 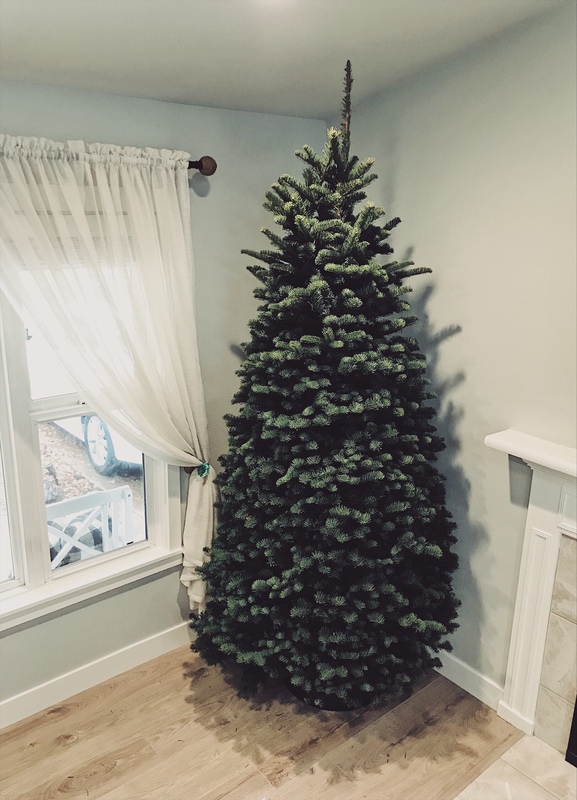 We got ourselves an 8 ft. Douglas Fir which is my favorite kind of tree. Once we got it home we pounded the bottom of the stump with a hammer, this helps to activate the cells of the tree (at least that’s what the hubs tells me). This is a useful tip I learned and helps prolong your tree. Pop it in the tree base and bring it inside. 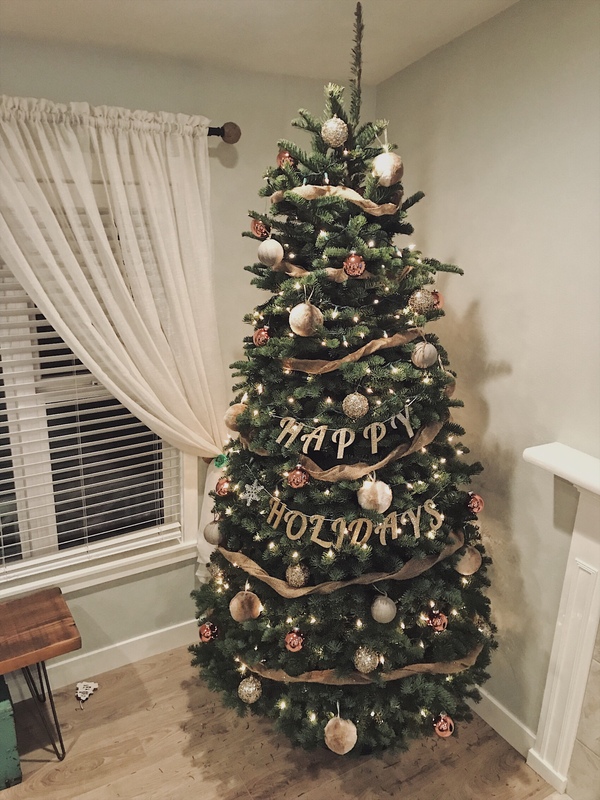 Step 2: Add a festive tree garland around your tree. I chose burlap this year. I found mine years back at Michael’s but Hobby Lobby also carries it. I twirled mine to give it a bit more texture. Step 3: Add lights. I love clear lights as I am always drawn to the more classic Christmas style. We strung the lights between the burlap sections. We used about 2 rows of clear lights per section. Step 4: Add a festive banner. I got mine a few years back from Paper Source. I also have another one that I made myself out of craft triangles and twine but I went with the metallic rose gold one this year. The banner tagged here is from Etsy and I love supported small businesses so check that one out. Step 5: Add lots and lots of ornaments. 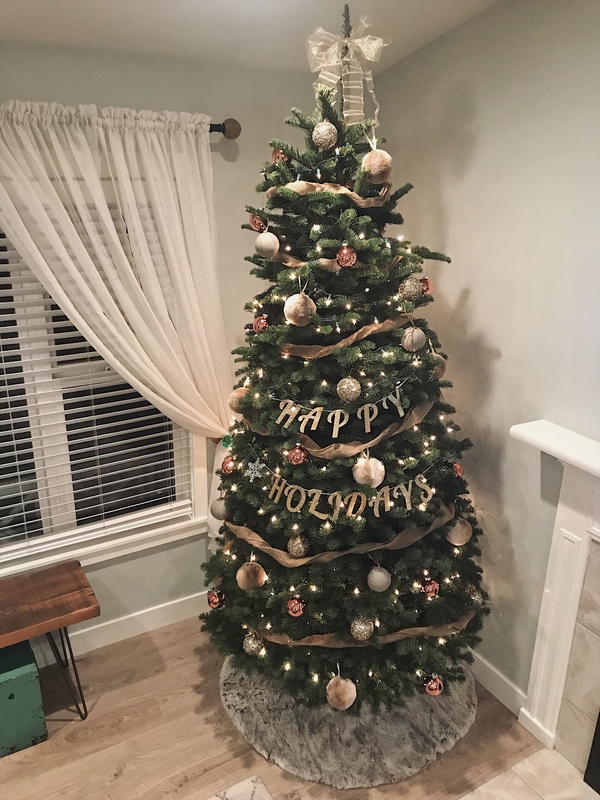 I went with the modern neutral tree theme this year. All of my ornaments are from Hobby Lobby. I got round copper balls, some bigger faux fur balls to add some texture, some sparkly champagne balls, and some burlap balls to tie in the burlap garland. Try to get various textures and sizes if you plan to do all of the same shaped ornaments. Step 6: Add your tree topper. I always do a handmade bow, this year I chose a see through gold ribbon for my bow. Every single year I go on the hunt for a modern tree topper and I have yet to find one that I like. If anyone sees a cute modern one PLEASE PLEASE send it my way as they are hard to come by. I love bows so this will do for me. Step 7: Add your tree skirt. Mine is from Hobby Lobby and I went with a fuzzy textured one to tie in the with the fluffy ornaments on the tree. We shall see how long it takes for my dog to make this her permanent bed. I better get some presents under it ASAP. That’s it! Super quick and easy and can be done in one afternoon. 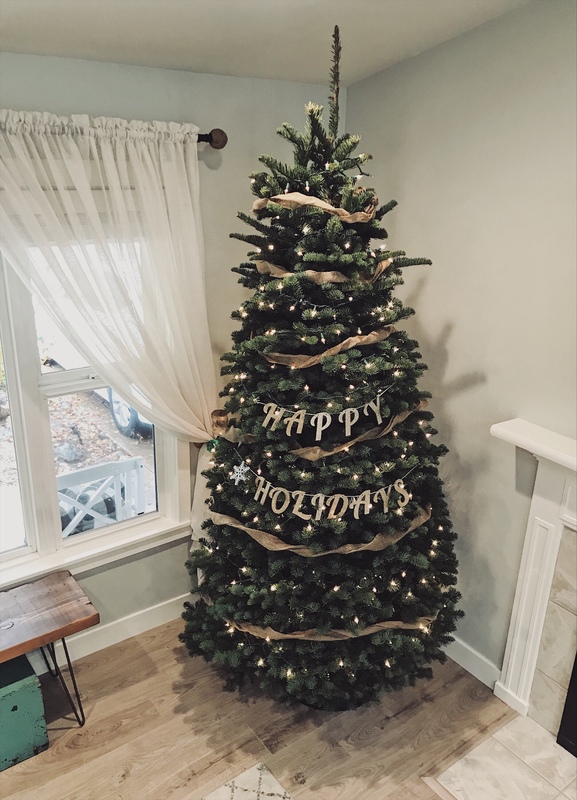 I love decorating for Christmas and we had a blast yesterday setting it all up. Now lets see how long it takes Beckett to pull all of the low ornaments off. I give it a day until my tree looks nothing like this. Ahhh mom life, its the best life. Happy Holidays to you and yours. I cant wait to see all of your trees, DM me your pictures. 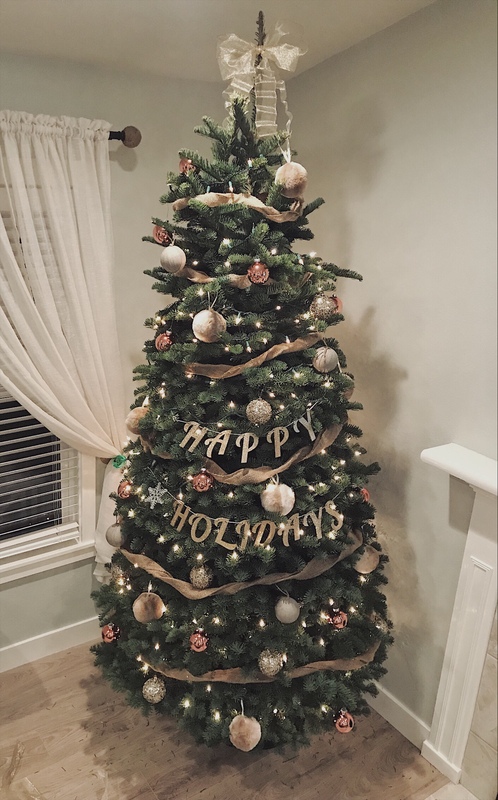 NOT PICTURED: The copious amounts of Baileys and Hot Chocolate we consumed to get this tree looking just right. Wife to Nick, Mommy to Beckett and our puggle pup Barley. Born and raised in Santa Cruz, CA. I have 2 brother and 2 sisters. I work full time for a wholesale clothing company called Tart Collections and i LOVE it.